To make this tag, you need to have the kit called Passion made by AW Design and it can be purchased HERE or HERE. 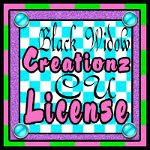 I used a tube by Rebecca Sinz, which needs a license to be used and can be purchased at DSI. The mask is from Mask Pack 2 at TallChic D-Zines. And the font I used is called ItHornet. 2. Make the background transparent by going to LAYERS>TRANSPARENCY>COLOR TO ALPHA. Then open up as layers paper Rose 4 and scale to 396 x 395. Right click on this layer in layers box and choose Alpha to Selection... Then go to SELECT>GROW by 5. Use the color pick tool to get the light shade in the paper. Add a new layer and fill with that color. Add another layer by growing by 5, but fill with the dark shade in the paper. Merge these 2 new layers you made and add noise by going to FILTERS>NOISE>RGB NOISE and set at 20/20/20/0. 3. Open as layers mask 5. Go to COLORS>INVERT then LAYER>TRANSPARENCY. Resize to 403 x 493 and adjust the color by going to COLORS>COLORIZE to a dusty pink shade. Change the opacity to 58. Move to bottom layer behind the merged layers you made in step 2. 4. Open as layers 18 in the kit (pink and purple wrap) and scale to 308 x 46 and position over the paper and added layers so it appears to wrap around. 5. Open as layers 10 (the decoration/embellishment) and position in middle of paper and added layers. Use colorize to get it to a dark purple color. Then right click on the Rose4 layer and choose Alpha to Selection. Go to SELECT>INVERT and click on the layer 10 layer then click EDIT>CLEAR. 6. Add your tube to the equation. Add a drop shadow to the tube by going to FILTERS>LIGHT AND SHADOW>DROP SHADOW and have the settings at 4/4/9... Crop it out just by using the rectangle select tool to get it right. 7. Write out you name or whatever text you'd like and add noise. Add a drop shadow with same settings as above. 8. Do NOT forget to add your copyright information to your tag when using your tube! Include copyright symbol, artist's name and website as well as your license number and name if applicable. 9. Save as .xcf or.psd then merge all the layers in layer box until you get to the layer 10 (embellishment). SKIP THIS LAYER and click on the next layer and merge the rest of the layers. You should end up with 3 layers. You want 9. SO make 2 copies of each layer. Then reorder them so they are back in the order they were when there was 3. 10. Right click in layers box on layer 10. Choose Alpha to Selection. Then add noise to that layer. Find the copy a couple layers down and add nosie to this layer too, and one more time to the last layer. THEN merge the layers so there are 3 complete layers. Make sure white is your background color and then right click on each layer in layers box and choose Remove Alpha Channel. 11. Use the rectangle selection tool to crop out excess space around the edges. Save the tag as a .gif and when the dialog box comes up, make sure to click save as animation and the delay entered for all frames... I used 100 milliseconds. Then upload tag to a photosharing site like Photobucket or Fotki, etc. I hope you found this tutorial helpful! Animation is a few more steps to take, but sometimes adds a little more character to your tag and is usually pleasant to the eye :) Thanks for viewing!